Had a good (needed) night sleeps last night, except for one call in the middle of the night letting me know Annabelle’s blood pressure was really high. They turned a med down, and that helped a little. I think, though, this is much because she is missing her normal blood pressure medicine that she is on, but since we aren’t using her gut, they haven’t given it to her. It still has air in it, but the more concerning part is that there is air in her liver. The surgeons believe this actually happened yesterday morning when her oxygen level was too low. 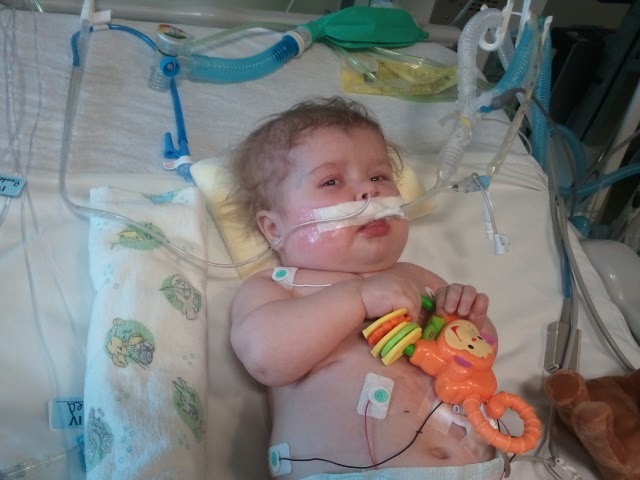 Her intestines didn’t get enough O2, which causes them to weaken, and some of the gas that was in her belly then went through the intestine wall into her liver. Surgery would be needed only if they felt her intestine wasn’t “working” in a spot (in which they would cut the spot out… YUCK), but they don’t believe that is the case. They are recommending that we go on “bowel” rest for the next 4 days, meaning she is put on IV nutrition to let her gut rest, then start back feeds very slowly. But as to the cause of yesterday morning…. The jury is still out. And Mom isn’t certain she loves the jury’s verdict. I think everyone is banking on this being a respiratory virus. I understand… because her lungs are very wet… but my gut just says there is something more. Anyway, they noted this morning that even if cultures came back, they might still just assume it was a virus/infection that was undetected, but Mommy is NOT OK WITH THAT AT ALL! While I’ve been in the hospital long enough to completely understand why they sometimes do this, so am not blaming them, my gut tells me there is something more, and while we have to be here, I WANT TO FIND IT! Because tomorrow, the transplant team will be here, and they defer most of the “heart” stuff to them. So today, we are just trying to stay stable, resting her gut, making some decisions about blood pressure medicine, but that’s it. Her BNP was down a little today from 2200 to 1500… 1500 is still WAY high though, but they are encouraged that it went down. While I am encouraged, I am not convinced it means that it is all viral lung issues vs heart. One bright light… she is awake a little, and I got her a few little rattles from the playroom and she is grasping them and moving them around! Makes Momma’s heart feel a little better, something so simple, so normal, so ANNABELLE. Your prayers for wisdom for the doctors is appreciated! Also discernment for Scott and I on when to push for more answers/tests is appreciated too. I am a lurker here, have been for many months now, even though I have never commented. My 15 year old daughter checks in too when she sees I am on your site. I have prayed and cheered and prayed some more for Annabelle and for your family. Today you are all front and center in my prayers as you seek more answers. She is such a precious princess of our Lord and King, as are your other girls. Many prayers coming your way. It is so hard when your mommy intuition is telling you one thing and the doctors are telling you another. You know her best, so be sure to let them know your concerns. You are on my mind all the time and I pray for your little girl to get better and be back home with you soon. Praying you have a day of rest today and that the next step is clear. Glad to see the BNP is trending down. While I pray this is all a respiratory illness (yet what a horrible thing to go through for illnesses in the future) I mainly will Pray for God to put the right doctors and nurses in Annabelle's path to discern what is truly going on. Still praying here. Peace and wisdom to you from our Lord and Savior, Jesus Christ. I'm a cardiac ICU nurse…definitely not a pediatric nurse, but I've been pondering little Annabelle for the last day or so. I know you said that she is prone to being "junky". Do you think it's possible that she had a mucous plug which precipitated all of this. I've had patients who have gone into cardiac arrest because of them, and then recover after the problem was resolved. Also, has she ever had a bronchoscopy of her lungs? I'm sure I'm just grasping at straws here, but we do them a fair amount, just to get a good visual of the airway to make sure nothing else is going on. Like I said, I've just been thinking and pondering. I'm sure all the doctors have considered these already, but I just thought I'd throw them out there. Praying for little Annabelle, and hoping you guys have some answers soon. Praying for wisdom and discernment. Praying for answers and for rest. So happy to see a picture of Annabelle playing with the rattle. Krista, I learned through my friend's daughter's liver transplant that it's not an easy road. It has its ups and downs. But I'm believing God for Annabelle's healing. Jehovah-Rapha is able and I'm praying His touch on her to stabilize her. And I'm praying for the rest of your family as well. I know it's hard for her sisters, too. Praying that the doctors would have wisdom and that you and your family would have peace…and comfort. Will be praying as you go through this most recent admission. I totally understand your feeling of thinking some deeper is going on; I, too, have gone through that with my daughter (who has HLHS and is now 6), and every time, I was right. So keep praying for discernment, but don't just let them take the easy way out. You are Annabelle's advocate, and you know her best. God gave us Mom's intuition for a reason! Praying you find an answer soon. God Bless. At least you have today a day of relative rest. I hope tomorrow will bring some answers. This morning in church I just couldn't get Annabelle out of my mind … and I've been praying for her off and on al day. I second others when they say that God gave us "mother's intuition" for a reason. I speak from experience on this situation. Speak your concerns lovingly but firmly. I will be praying specifically for wisdom for you, Scott and the doctors and nurses. I will be praying for Annabelle and that the problem is found and treated. I will also request prayer for her at our small group tonight. I hope and pray that the rest of your day is as restful as it can be in your situation. I am praying for Annabelle constantly. My heart is breaking over this. I hoped for news- an answer today, but I will keep on praying for you all. We've had a long 6 weeks with a roller coaster ride since my preemie granddaughter came 11 weeks early. How would any of us handle these kinds of situations without faith that God is in control and loves those little ones in a way, even we don't understand. Thank you for keeping us updated. I'm putting Annabelle on the email urgent prayer list. We'll ask for wisdom for the doctors, you, and Scott, as well as healing for your sweet baby. Praying for Annabelle, her medical team, and for you and Scott as you wait for results and make yet more difficult decisions. Praying for little Annabelle and for you. May our Great Physician and Healer Jesus Christ lay His hands on Annabelle and heal her. Oh, and I also wanted to add, trust that mother's intuition. My son had a mild form of AVSD and it was only detected because I couldn't shake the feeling something was terribly, terribly wrong. Push if you need to – you are Annabelle's advocate – and may you be given the wisdom to know when the right time to push the issue is. Continuing to pray for precious little Annabelle. My heart just breaks reading about this latest setback. I agree with the other posts. You are Annabelle's greatest advocate and if you feel something is wrong, don't be afraid to speak your concerns. Praying for you and Scott and all the doctors and nurses that the right decisions will be made and if there is something more going on, they will find it. Praying for wisdom Krista! You are in my thoughts and prayers constantly. So glad they are letting her rest and heal! So many out here praying for your daughter and all of your family. Hope you are comforted in the shower of all those prayers. Shhh, Did you hear the rush of angels wings?? Sending more angels to surround the princess and keep her safe and on the road to good health. I am just a lurker that has been praying for your sweet family over the last few months. I know how stressful things can be with a special needs child ( I also have one) I know of a program that can help pay for your medical supplies, care and even an aide. Feel free to email me and I will pass the info on to you.